It’s best to get vitamins from your normal diet, but due to our busy lifestyles it’s not always easy to prepare healthy food and get all the vitamins your body requires. 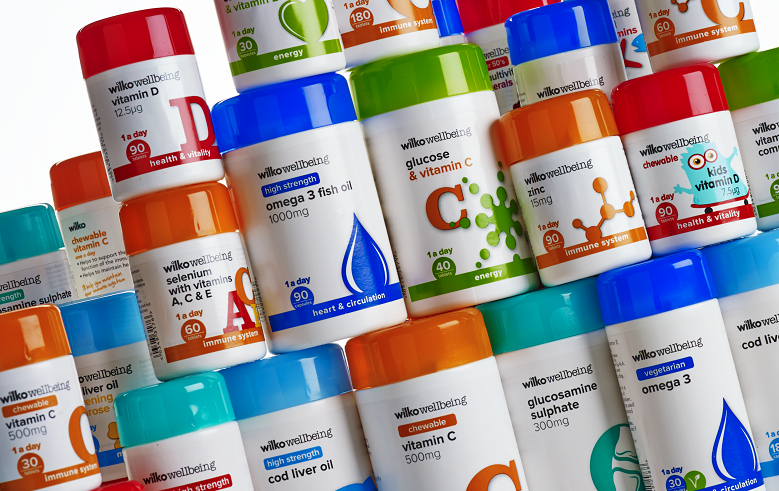 At Wilko, we’ve got a new range of great value vitamins to help you complement your diet with the vitamins you need. Your body requires different vitamins depending on the stage of your life, and we’ve got a great range of products for every need. Warning – Always consult your GP before taking any vitamin or mineral supplements. If you’ve got a busy and demanding lifestyle, check out our great range of vitamins to help energy release. Our 1 a day energy release tablets contain a carefully selected combination of vitamins and minerals, including vitamins B1, B2, B6 and B12 for energy release from food. Our orange effervescent energy release tablets provide vitamins B1, B2 and B6 to help maintain energy release from food, and magnesium to support healthy muscle function. Pop a tablet in a glass of water to make a delicious orange flavoured drink! To help maintain a healthy heart, try our high strength omega 3 fish oil capsules, which contain EPA (eicosapentaenoic acid) and DHA (docosahexaenoic acid). EPA and DHA are omega 3 fatty acids that are plentiful in fish and shellfish… these are great for people who don’t like fish! We also have omega 3,6 and 9 capsules to help to keep your heart healthy. These handy little capsules contain Alpha-linolenic acid (ALA) which helps maintain normal blood cholesterol levels. Start your beauty regime from the inside with our skin, hair and nails tablets, which have been specially developed to help maintain great looking skin, hair and nails. Many women like to take evening primrose oil around the time of their period, because it contains essential unsaturated fatty acids. Check out our standard strength and high strength capsules. 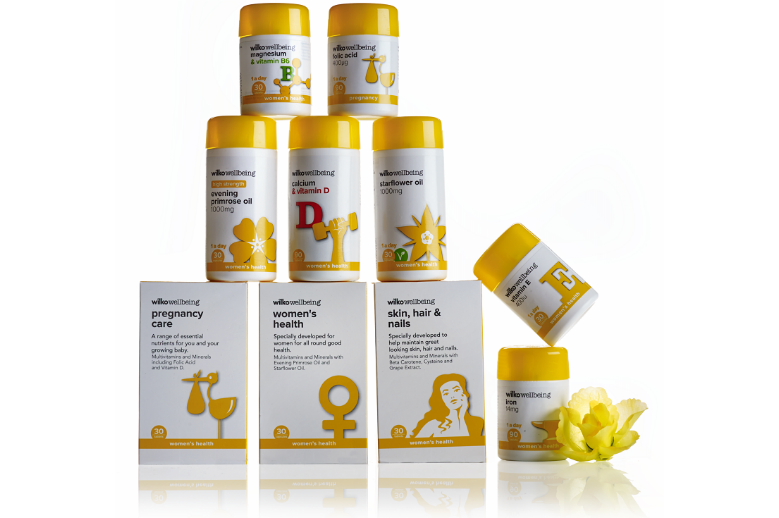 If you’re looking to start or grow your family, our pregnancy care tablets are ideal. They include a special combination of essential vitamins and minerals with folic acid, for you and your growing baby. Folic acid contributes to maternal tissue growth during pregnancy, and we also have a large 90 pack of folic acid – the Government’s Chief Medical Officer advises that women who are pregnant or trying to conceive should take folic acid every day until the 12th week of pregnancy. If you experience the menopause, consider our menopause multivitamins and minerals with soya isoflavones, which has been developed for women at this time of change. Don’t forget your little one with our children’s vitamins! Our children’s chewable vitamin D with sweetener contributes to normal bones and teeth, and helps to support a healthy immune system. Great for your little one as they contain no artificial flavours or preservatives! Our kids’ vitamins A, C, D and E jellies are also ideal as they have no artificial flavours or preservatives, and are strawberry flavoured so they’re sure to be a big hit! We have a great range of vitamin C to help maintain a healthy immune system including including a high strength vitamin C and zinc effervescent for those who like to up their water intake, chewable vitamin C for those who like to take their vitamins on the go, and even a slow release pack, which provides a gradual release of vitamin C throughout the day. For general health & vitality, we’ve all sorts of vitamins! Check out our great value A-Z multivitamins and minerals, a carefully selected combination of vitamins and minerals to help support general well-being, including Vitamin B1, B2 and B6 for energy release from food. We also have a version for the over 50’s. Our men’s health food supplement has been specially developed for men, for all round good health. Contains magnesium and Vitamin D for normal muscle function, and Vitamin B2 and niacin for normal function of the nervous system. Also includes ginseng for vitality. Cartilage and bone health are important for your wellbeing, to help keep you mobile. Glucosamine is found naturally in the body’s cartilage and is a major structural component within joint tissue. Glucosamine supplements such as our extra high strength glucosamine sulphate contain Vitamin C, which contributes to normal collagen formation for the normal function of bones and cartilage, which may help maintain healthy joints. Cod liver oil contains Vitamin D, which helps maintain healthy bones and muscles to keep you mobile, and we’ve got every type of cod liver oil you could possibly wish for! Our range includes standard capsules, high strength, liquid form, cod liver oil with evening primrose oil, and cod liver oil with glucosamine. Our fantastic new range is formulated using the finest ingredients to create high quality products. Check out our range online, or pop into your local Wilko where a team member will be happy to help.